Where are downloads on iPhone and iPad? New to iPhone and don't know how to access the files you stored from the web? iPhone, unlike Android, doesn't have a Download folder and you need a separate technique to store your files. Read on to know how to download and save files on your iPhone. On Android devices, there is a Downloads folder where you can store all the files you've downloaded on the Web. You can then move, copy and share the files easily thanks to the open file system. On iOS, things are not that easy. Since it's a closed operating system where everything is taken care by apps, there is no similar "Downloads" folder you can find on your iPhone and iPad. When it comes to this aspect, Apple provides their users with a different approach and in this article, I'll help you get used to it. Saving images from Safari is pretty simple, you just need to tap and hold on an image. This will bring up various options and one will let you save the image to your Camera Roll. For document files, such as PDF or Microsoft Word documents, Safari will download and open these files for you without having to use other apps. You may be asking "How can I know it's downloading?" Well, downloading these files is like loading a web page, once loaded, Safari will open the file in the current download tab. Although the file has been downloaded, it's not saved yet. If you close Safari or the tab opening the file, the next time, you'll need to load the file again to open it. This means the file is only saved temporarily. In this case, you'll need to import the downloaded file to another application. Dropbox is a great choice. It's free, reliable and easy to use. If you've installed the Dropbox app on your device, you can start saving files to this cloud storage service and even use your files offline thanks to the "Make Available Offline" features. 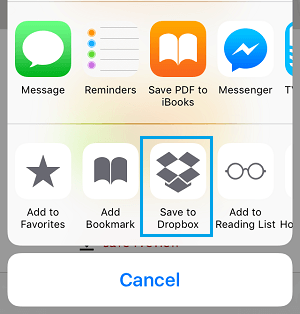 Step 2: Tap on the "Save to Dropbox" option in the Share sheet. Next, select the target location for your download. 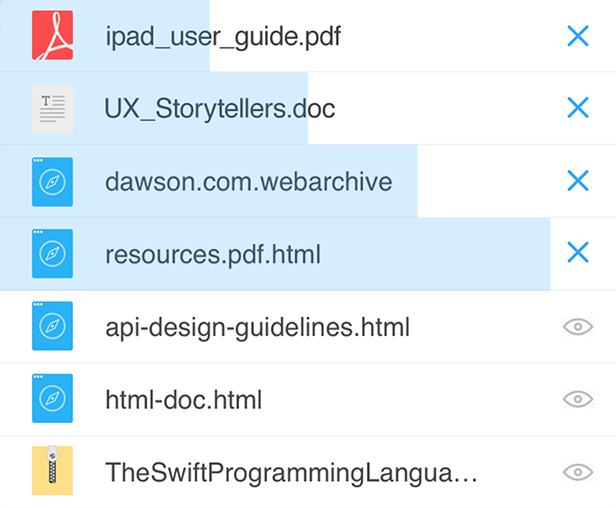 You can pick other folders in Dropbox, or simply save it to the root of your cloud. Finally, tap on the Save button located at the top right corner to start saving the file to Dropbox. 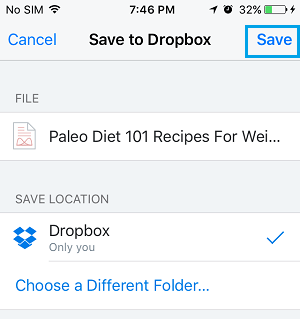 Note: If the "Save to Dropbox" option is not available in the Share sheet, look for the More button and select it. Next, you can find the "Save to Dropbox" toggle and turn it on. Step 3: Now your file is downloaded and saved to Dropbox, but it's still not available for offline use yet. You can easily resolve it by tapping on the Down-arrow button next to the File and selecting the "Make Available Offline" option in the pop-up menu. Audio and video files are natively supported by Apple so these file types will be played automatically. If you would like to save them, the only option is to use a third-party web browser with the download function. There are a couple of apps for this purpose and Documents by Readle is my app of choice. In addition to being a file manager, it's also a media player and a powerful file downloader for iPhone and iPad. You can download it for free from the App Store if you haven't done so yet. Using the built-in web browser, you can tap and access the direct download link. Documents will bring up a file saving dialogue box, letting you change the location to store the file. Tap "Save", the file will start downloading immediately. Not only Documents provide you with the possibility to download and play media files, it also lets you save .zip, .rar, documents, and literally anything from the Web.